Whether your deck focuses on dealing damage or milling your opponent, whether you’re committed to the light side or devoted to the dark, you can find a Dice Binder that’s perfect for you. Each of these three spacious dice binders has room for 44 dice and 44 sleeved cards, offering convenient storage and protection for your most valuable Star Wars: Destiny cards. With every die visible simultaneously, finding the die you want has never been easier. 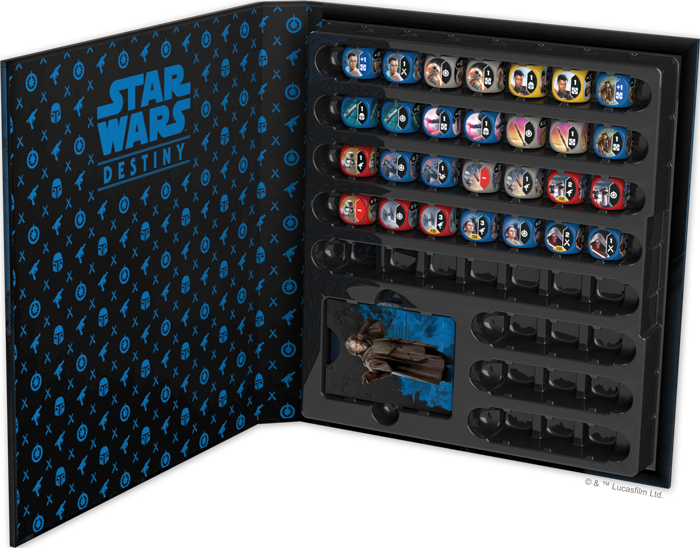 Each Dice Binder also features stunning art of an iconic character from the newer Star Wars movies. You may pledge yourself to the First Order, commanding Captain Phasma as she leads her stormtroopers into battle. You may learn the ways of the Force alongside Luke Skywalker on the planet Ahch-To. Or, you may embark on a desperate mission to steal the Death Star plans with Jyn Erso. With one of these characters emblazoned on the cover of your Dice Binder, you can represent your own strength and fortitude in every game. You’ve already built your perfect deck and collected your most valuable cards. Now, it’s time to store them in style. Pick up your copies of these Dice Binders at your local retailer or online through our webstore today!